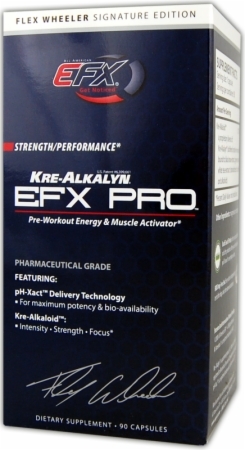 Kre-Alkalyn(r) EFX Pro represents the next level of drug-free performance-enhancing supplementation. By combining multi-patented and award winning Kre-Alkalyn(r) EFX creatine with our newest technology, Kre-Alkaloid(tm) Neuro-modulating matrix, you are sure to unlock your true potential and push past all previous limits faster than ever before. pH-Xact(tm) Delivery Technology - It's not how much you take, it's how much you absorb. pH-Xact(tm) delivery technology ensures optimal bio-availability of our formulas by giving them the precise pH levels necessary to rapidly shuttle nutrients to the bloodstream with maximum potency.